Just two were built, one survived. Unfortunately, the one that sirvived isn’t 100% complete. It’s missing at least the bespoke front fender flares and bits of the interior. The dark one (with front fender flares present) was likely destroyed by the manufacturer. 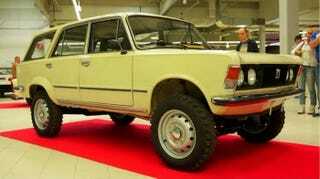 The car uses a modified Niva 4x4 drivetrain and suspension, and a regular 125p engine.